Hand-blown, solar-powered string of lights. Not is this string of hand blown (mouth blown?) lights delightful for any decorative holiday display, they’re powered by solar energy! You can find them at furniturehomedesign.com. Who knew a collection of one item could be so diverse? 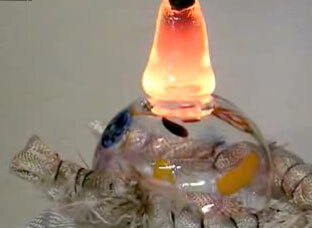 Check out the video of a glass ornament being blown over at Atlantic Art Glass in Maine. and be sure to buy handmade this season! One of the best known glass blowers in the world today is Dale Chihuly. While surfing the internet I came across the BloggerWarks blog. The write had just visted the Blenko Glass Factory and she showed this beautiful display of Thanksgiving glass pieces that were handblown. Wouldn’t it be fun to get together with a group of friends and learn to blow your own glass? That’s just what these friends did at the Tacoma Glass Blowing Studio. Look at what they ended up with! Newt Grover’s Art Glass, in my own backyard. Since starting to blog for Craft Gossip I’ve been scouring the internet for all forms of glass art. An interesting thing is that in my blanket searches I’m finding amazing artists right in my own backyard.